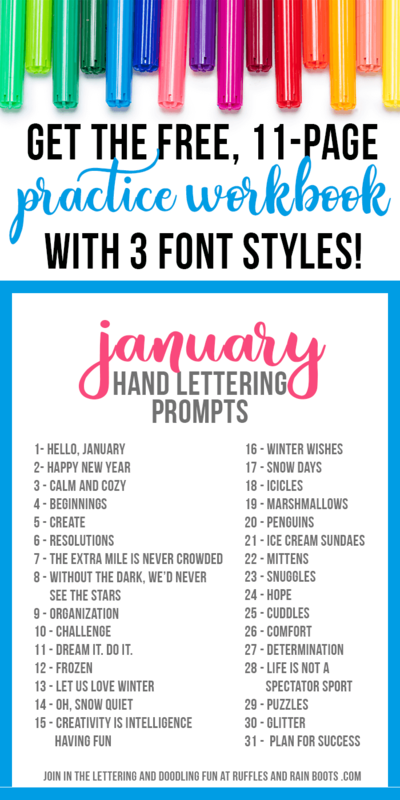 This free lettering workbook can be used for January hand lettering prompts, January crafts, doodles, or even bullet journal layouts for January. Included are the fonts and the practice sheets. 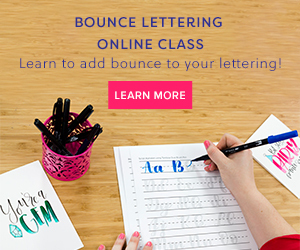 If you’re new, get started with hand-lettering for free! I rarely find myself staring at a blank page for long but it does happen from time to time. 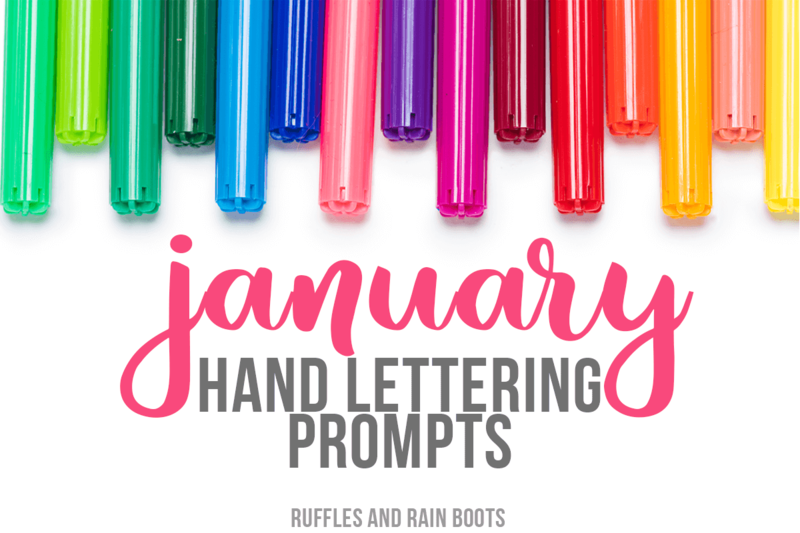 In order to help inspire you to create, I’ve developed a list of January hand lettering prompts and hand lettering practice sheets. 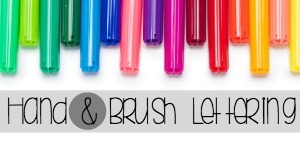 But don’t think this is only limited to practicing your brush lettering, calligraphy, or word doodles. I’ve already used these prompts to create cards, a wall display, and even a play prompt for my daughter and her friend. I am always falling in love with fonts I find and it can be such a pain trying to track them down. So instead of transferring that frustration to you, I am including the fonts I have used in this set of January hand lettering prompts. 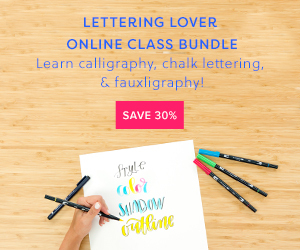 If one of these fonts strikes your fancy, grab it and create your own hand-lettering practice sheets. If you are subscribed to our newsletter, you already have the password (it’s at the bottom of every email I send). Grab that password and get the January Workbook here. Often, I’m inspired by a phrase, quote, or even a single word. I like to practice writing the word first, maybe sketch a layout for a piece, and then set my sights on my final project. You can use these the same way throughout the month, printing as many copies as you need. Just note: if you’d like to share with your friends, please share this post on Facebook and Pinterest. That way, they’ll be able to get this set of hand lettering prompts, the free brush lettering workbook, and all future sets. Do you have a favorite hand-lettering style? What about your favorite sources of inspiration? Will you use these hand lettering practice sheets to build up your style or practice January lettering? 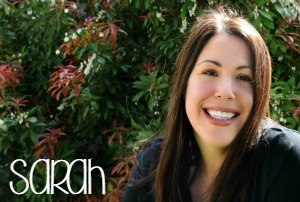 Sarah, I’m late signing up and I’m trying to get the January Hand Lettering Prompts Workbook link but it going to Fonts Used. Sandra, If you click on the words, “January 2018,” it will take you to the file. I’ll rewrite that page so it’s easier for others. Thanks for letting me know.